Former Military President Ibrahim Babangida has faulted the perception that he is corrupt. He challenged anybody with proof of corruption during his 1985 – 1993 regime to come forward with them. Gen. Babangida said members of his government are angels compared with what he is reading in the newspapers about what is going on now. He requested any Nigerian with a shred of corruption against him to release the facts to the public. The former military president said the $12.4b Gulf Oil War windfall of 1991 was not stolen. The EFCC released the transcript of the interview to reporters in Abuja yesterday. He said: “Let me tell you something, maybe you have a hand in it. I have been the most investigated President Nigeria has ever had. By now, somebody should have come forward to say here it is. He said he and those who served in his administration were saints and angels going by the level of corruption in the country. “Well, we had different approaches. I think my government was able to identify corruption-prone areas and checked them. If you remember in this country, there were things they call essential commodities. These are also sources of corruption. You go and buy Omo or food or whatever it is and we got government to take its hands off such activities. Let people use their own brains, hands and labour, nobody has to do it for them. So we did but I am proud to say that was much more effective. On the allegation that his military regime institutionalized corruption in Nigeria, Gen. Babangida said though he had been aware of such insinuation, the assumption is incorrect. He added: “Yeah, I know. Maybe I have to accept that but anybody with a sense of fairness has no option but to call us saints. I give you an example, in a year I was making less than $7billion in oil revenue. In the same period, there are governments that are making $200billion to $300billion. The ex-President said being branded as corrupt was a question of perception. He said: “It is said that perception is not reality. Why the perception? I should ask you because it is the perception of the media. You believed quite wrongly that we are all crooks and I bear no grudge whatsoever against anybody but I know time will come when they will say after all, they did something and this is what is happening. Pressed further on his investments, Babangida admitted owning shares in a bank. I would assure you, using my head, I came to the conclusion that the best investment for someone like me is banking. That’s all. You have shares in banks? Which bank are we talking of? On how he built his Hilltop Mansion in Minna, Babangida said: “I cannot estimate because it has appreciated. I know what my friends spent. No, my friends contributed. “They were friends before we came into government and friends while I was in government. Concerning the $12.4billion oil windfall from the 1991 Gulf War, Babangida insisted the money was not stolen. “First of all, that war lasted three months, about ninety something days. It didn’t last up to a year. So get the facts straight. “Secondly, the oil price at that time was below $18 per barrel. So, there is no way you could make $12.4billion in three months. “We could not have made that amount of money but Pius Okigbo knew what he was doing. He had brains and he said between 1986 or 1988 to 1994, monies accrued to the Federal Government at that time was about that money you are calling windfall. He said so. It is there in his book. “Then the other thing he said, the monies could have gone into generative investment. I am not an economist but I have an understanding of what this is. “Our argument then was if you have the money, why keep it and be looking at it when you have a lot of things that will benefit the ordinary man. So that money was not stolen. Asked to identify the infrastructure, Gen. Babangida said: “Abuja for example, I built Abuja. Today, we have a brand new capital. We used that money. “I gave you a Third Mainland Bridge in Lagos. You cannot build it now for all the money Nigeria is making. And what did it cost me? N500million, N600million, N700million. Despite the annulment of the June 12, 1993 presidential election, he admitted that the poll was the most credible in the history of Nigeria. He also opened up on why a former Minister of FCT, Gen. Mamman Vatsa was killed after his involvement in the 1995 coup d’etat. He said his hands were tied by military law which was inevitably applied by his regime. The annulled poll was won by the late business mogul, Chief M.K.O. Abiola, who later died in detention while struggling to reclaim his mandate. “We gave you a lot of reasons but I understood the passion. At that time, everybody was fed up. The sentiment was: just pack your things and go. Our thought process is very limited. He admitted that the annulment was supported by some Nigerians and pro-June 12 activists. He added: “I hate to say it but when we annulled June 12 poll, the same Nigerians supported the intervention of the military, true or false? Asked why he used the phrase ‘step aside’ to leave power in 1993, Babangida said it was a military parlance. On why Gen. Mamman Vatsa was killed, Gen. Babangida said he was hamstrung by the law. He added: “Because others before him faced the same law, the only change in that law was introduced by us to give room for appeal. “If I was involved in that coup and it flopped, I would have been shot too. So it is the application of the law but then it is painful. 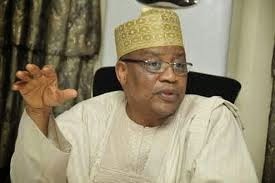 Responding to a question, Babangida said the military indulged in coup d’etat each time there was frustration in the society. He however described military interregnum as a phase that the country was going through at that time.